The biggest little city in the world is going through some not-so-little big shifts. In 1990, the hospitality industry accounted for 26 percent of jobs in and around Reno, Nevada. Today it’s just 17 percent, driven by the Great Recession as well as the longer-term, slow decline of the Nevada gaming industry. Meanwhile, the tech industry is making huge moves in the area. Apple started a wave, moving in with a data center just outside Reno in 2012, part of its own plan to spend a billion dollars around Reno in the following decade. The company even built a solar energy plant just to power the data center. Earlier this year, Apple filed paperwork to building a second data center nearby. Tesla, the electric car manufacturer, is building a $5 billion “gigafactory” in the area. The city wants to make sure that the benefits of the emerging reincarnation of the Reno economy get distributed equitably. For many, including Vice Mayor Oscar Delgado (who’s a Next City Vanguard), that starts with dealing with blighted properties all over the city, from downtown to neighborhoods on the outskirts. The city has long had issues with slumlords, according to Delgado, because of a lack of public resources. The city would issue warnings and orders to bring properties up to code, but never had the resources to go in and do the demolition work itself (issuing a lien for property owners to pick up the bill later). With no real threat from the city, negligent property owners let things slip. It was one of the first issues Delgado began working on, after being elected to council in 2012. Last year, city council finally set aside a blight abatement fund of $790,000 for demolition and cleanup of troublesome properties, and abatement of blight on public properties. “Since we’ve put that in place, almost a year ago now, we’ve seen four or five properties across the city that, now that we have the leverage, and our staff feel like they now can have teeth to do something, property owners have now taken it upon themselves to now demolish or bring buildings up to standards,” Delgado says. Thanks in part to a $10 million budget surplus in 2015, the city has dedicated even more resources to the issue. Specifically, another $1 million, which Delgado has divvied up four ways, starting with an additional contribution to the general citywide blight abatement fund. Another part of the $1 million will go to education assistance and investment. The city will distribute blight information materials, graffiti kits, and cleaning tools, install new trash cans (the solar-powered compactor Bigbelly receptacles now seen in many downtown areas), pay local artists or nonprofits to create murals, and fund riverside and neighborhood cleanups. Some of that $1 million is also set aside for “Neighborhood Renewal” grants, which will go to homeowners in qualified areas who apply for funds to repaint homes, improve landscapes, clean up exteriors and more. It will also be open to community groups, like churches, to apply for grants to improve community spaces. “If it’s a community asset that would provide more opportunity, I’m more than happy to champion something like that,” Delgado says. All of the $1 million must go into areas that would otherwise qualify for federal community development block grant (CDBG) funding, which is on the retreat ($2.5 billion in CDBG funding cuts since 2010, nationwide). “But I would say this is not so much to replace CDBG funding, what we’re trying to do here is leverage what we’re still getting,” Delgado says. 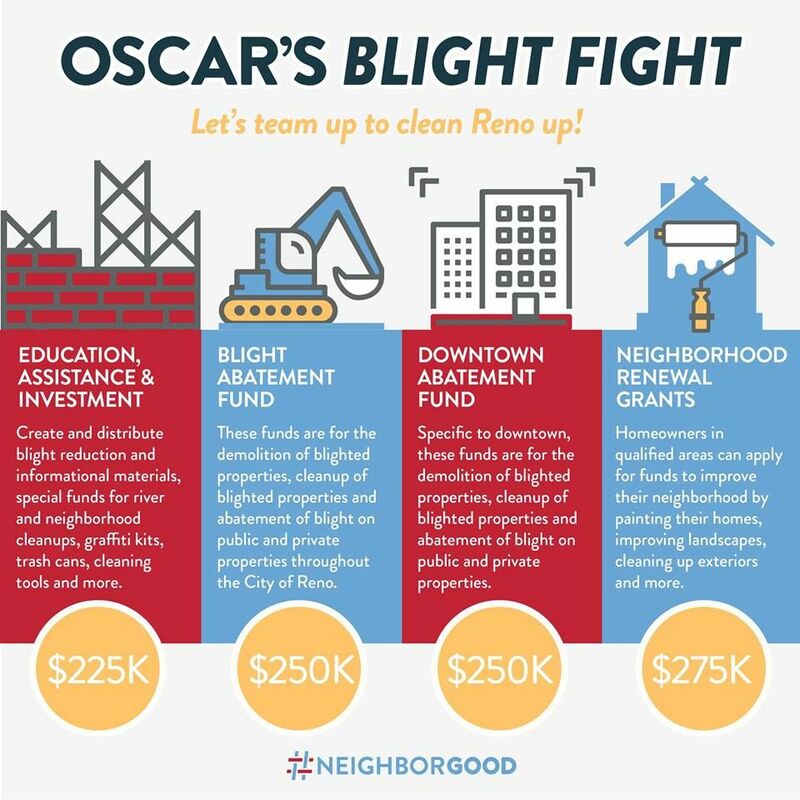 Some of the $1 million in blight revitalization funds will go toward blight abatement and demolition specifically in downtown Reno, which includes 4th Street Victory Way. “By putting in a new streetscape and having the blight removed, there’s overlapping successes there,” Delgado adds. Those efforts are being coordinated with a broader vision for downtown Reno, aided by a visit from planning experts from the Urban Land Institute. The plan centers on Virginia Street, where Reno’s casino strip is located, and maps out blight abatement needs and revitalization opportunities to create a walkable, unified downtown area meant for locals instead of tourists. “Our downtown was really developed for tourists,” Delgado admits. “Now we’re saying, ‘what are some broader uses.’” Pedestrian-friendly streetscapes and dedicated space for local businesses are all part of the conversation. Reno Startup Row is also along the corridor, focusing on local tech startups.